Inspired by the expression of terroir, the winemaker Jean-Paul knows that wines taste best when naturally produced. Working with 10ha in the northern part of the appellation Chateauneuf du Pape, and with 5ha in Cotes du Rhone, Jean-Paul took over the family vineyards in 1990. In 1905, his ancestors purchased the property and sold solely to negociants, while bottling for family and friends. 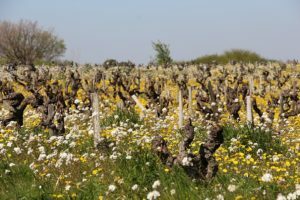 It wasn’t until the 1960’s that his father started bottling with greater intent, thereby providing Jean-Paul with the foundational knowledge that it took for him to develop his award winning wines. When Jean-Paul took over the estate in 1990, he began working towards organic certification while practicing biodynamics in the vineyard. Favoring wild yeasts and neutral woods, Daumen is a man of manual labor, who hand harvests his 100+ year old vines, punches down caps, and controls temperatures not with the aid of a computer system, but by checking the temperatures of tanks by hand, and regulating with “drapes”– the aluminum piping that carries hot or cold water to heat or cool the tanks. 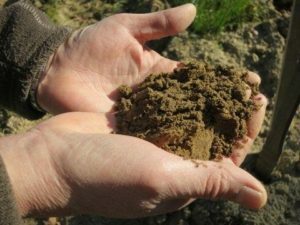 The terroir is a rocky, sandy soil, perfect for the Southern Rhone Valley. While the vines have an impressive average age of 60 years, the estate also has old Grenache vines that are over 100 years old! Biodynamic farming techniques are practiced in the vineyards. In their vineyards, they plant Grenache, Syrah, Mourvedre, Counoise and Cinsault. The vineyard is planted in parcels, but the plots are all field blends, and not separated by grape variety. Thus picked at the same time. In the making the wine, the thought process to the blending is on a parcel by parcel basis, and not based on a grape by grape variety choice. Low yields are the goal at Vieille Julienne. They are often under 20 hectoliters per hectare, which gives the wine a lot of its power, purity and concentration. The grapes are destemmed before alcoholic fermentation. At Vieille Julienne, all grapes are co-fermented. Aging takes place in a combination of foudres and old, oak barrels. This is Jean-Paul’s oldest vineyard, with vines that are beyond 100 years old. It is also the parent material for the parcels within his Chateauneuf vineyards. Indeed, this wine is not a Chateauneuf-du-Pape but it has a tendency to drink like one. 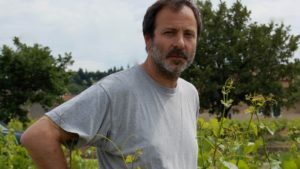 The truth about Clavin is that there is a mere twenty-foot wide road that separates his Chateauneuf vineyards from this particular “lieu-dit”(a phrase meaning literally “place name”), Clavin. 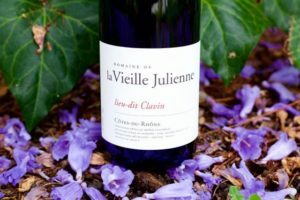 Jean-Paul thinks in some years Clavin can be better than his Chateauneuf, which commands three to four times the price. The wine is made of nearly 80% Grenache with the rest divided between Mouvedre and Syrah. Sulfites are added at the end of its year in foudre, just before bottling. The wine is neither fined nor filtered.